Chennai as a city has expanded hugely over past few years! So has it’s complexities and challenges. With rising urban population and infrastructure, basic human needs like air, water and food are becoming scarce. Specifically the quality of air and water has deteriorated so much, that it is important that a common man needs to be aware of its dangers and vulnerabilities. So what is Air Quality? In simple terms the quality of the air you breathe is “Air Quality”. As a kid you could have learnt the components of air like Nitrogen, Oxygen, Carbon-di-oxide, Inert Gases and water vapor. Well, that has how God made the world to be – Oxygen for human survival, Nitrogen for botanical nitrogen fixation and CO2 for plant kingdom. The proportions of nature are so much appropriately designed for human, animal, plant and aquatic ecosystems. However, over the past few decades, “Post-Industrialization” to be specific, the quality of air and these proportions are largely altered by human activities. It’s not one person as a human being, but what we do collectively as a globe, has slowly deteriorating the air with a variety of pollutants like dust, smog, smoke and trace chemical gaseous impurities. Now, the air we breathe has other components like Sulfur-di-oxide (SO2), Nitrogen-di-oxide (NO2), Particulate Matter (PM 10 or PM 2.5), Ozone, Hydrocarbons (HC), Volatile organic compounds (VOC), Carbon-mono-oxide,…. Imagine, this is what you breathe if you are living in a populated urbanized city like Chennai. A Cocktail of Chemicals! Most of the diseases that manifest in urban lives are due to problems of quality of air, water and food one intakes. Pollutants and Chemicals see no bias and it affects the good, bad, young and the old alike. The most vulnerable population is the young and the old citizens of Chennai. The disease vulnerability of air pollution is second-biggest intimidation, the first being smoking! There have been increased cases of Respiratory diseases, Tuberculosis, Bronchitis, Whooping cough, Lung cancers and cardiovascular damage and this to a large extent can be attributed to Air quality. Imagine a baby, less than year old breathing in Particulate Matters of size dimension 10 or 2.5? A recent study in Delhi claimed this scenario to be a baby smoking 25 cigarettes a day! That’s much the quality of air we breathe impacts our health. Prolonged exposure to bad air, can also create Fatiuge, Headache, anxiety and Nervous system damages. Across the Globe, around 800,00 people die each year due to urban air pollution. As of Mid-2018, Chennai ranks 52nd worst air polluted city with a pollution index of 78.75. 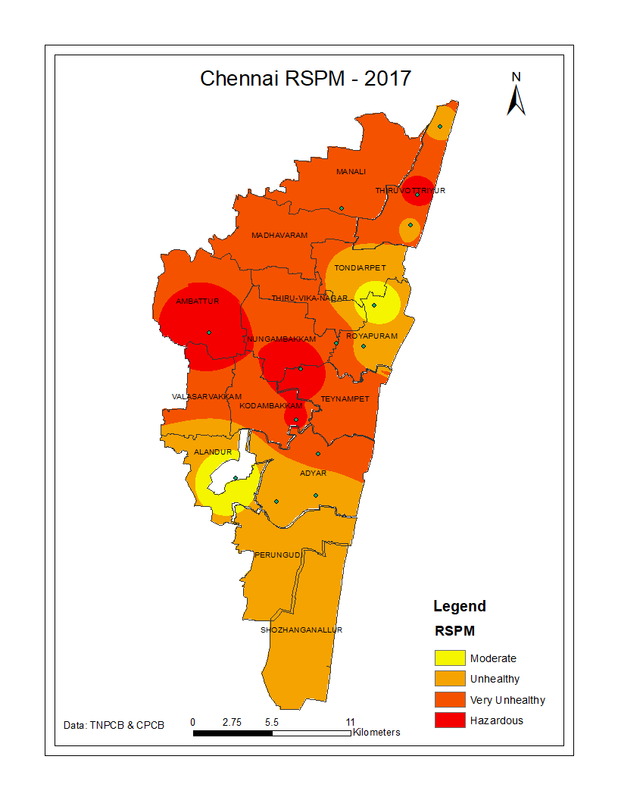 What are the worst polluted places in Chennai? While entire city has consistency been recognized for it’s worst air quality, a closer look at the Tamil Nadu Pollution Control Board (TNPCB) and Central Pollution Control Board (CPCB), does give some hints of the worst and better places to live in Chennai. Beware, that that the monitoring stations at the moment are limited to twelve locations. The data and statistics which are unofficial, like the data of US Consulate or AQI Real-time hourly Indices and other Research institutions have not been used for this analysis. From the data for Particulate Matter data for 2017, the worst places to live in Chennai are Anna Nagar (Yes! That posh area is no longer the best, at least in terms of air quality), Kilpauk, Nugambakkam and T-Nagar. These values are average from daily and monthly values of TNPCB and CPCB. We are spirit of Chennai, have also mapped the yearly averages for Chennai, so for you to get an idea of the best places to live in Chennai. Remember the values of stations available are interpolated for the 15 zones of Chennai. Hence the map is only indicative of the station datasets available. More stations datasets, better the accuracy of the map results. You can see that central and south Chennai is fairly less polluted than the north Chennai. This indicates a strong influence of vehicular pollutions and industrial pollution in northern part of the city. Though not the best, the datasets show that south Chennai and the expanding greater Chennai, in all likelihood, are ideal location for live in Chennai. In the Chennai air quality series, we will next cover domestic remedies to protect yourself and your family from air pollution. Previous articleIs Chennai Planning for its Old Aged Citizens – The people who built it! Next articleSenior Citizens – Benefits and Rights!